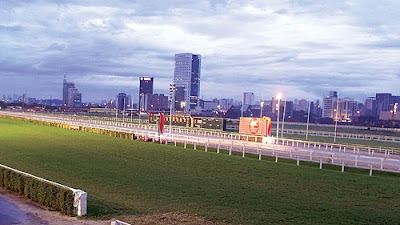 The pub's veranda provides this wonderful view not just of the horse race track, but also of the city. 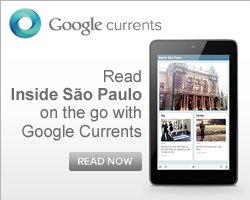 São Paulo offers some amazing options of places to expend some time. 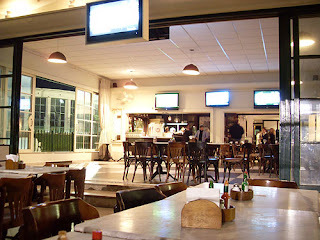 Mercearia São Roque, inside the Jockey Club of Sao Paulo, is one of the best pubs to have a beer in the afternoon. Located right in front of the horse race track, the tables on the veranda are a wonderful place to have a beer, watch some races and appreciate the wide city view. My advice is to visit on the weekend (everyday is great, but on weekends is quiet) and feel the mood of the place. Lots of overseas are around talking about business and horses. On the walls, it's possible to find marble tables, wood chairs, classic beer tap and some pictures of winner horses. It's a good place to have lunch, happy hour or dinner. When: Open every day: on Monday it opens at 5pm; Tuesday is a special day reserved for private events; Wednesday at 7pm; Thursday to Saturday at midday and Sunday from midday till 2am. From Thursday to Saturday there are special events that you can follow through the time schedule.